All Contractors must complete and submit a monthly return (CIS300) to HMRC regardless of whether or not you have actually made payments in the preceding month. This monthly return must contain details of all payments made to all subcontractors regardless of their tax treatment. The monthly return runs from the 06th of month one to 05th of month two and must be filed with HMRC by the 19th of month two (or 22nd if payment is being made electronically). For the tax month 06th April to 05th May the monthly return must be submitted by the 19th May. If no payments have been made a nil return must still be submitted by the required deadline. Payments can be processed on a weekly and/or monthly basis at the users discretion. While both payment runs operate independently of each other the records are merged for verification requests and monthly returns to HMRC. When all payments for the tax month have been finalised, BrightPay will offer to create a CIS300 monthly return for submitting to HMRC. The CIS300 informs HMRC of the payments made to subcontractors in the tax month. Simply select 'CIS' on the menu toolbar. This is the sole responsibility of the contractor. 4) If you know you’re not going to make any payments to subcontractors for up to 6 months, you should include this indicator in the return. 5) Click 'OK', the contents of the monthly return will be displayed on screen. The Monthly Return can be printed or exported at any time before or after its submission to HMRC by clicking 'Print' or 'Export'. 6) BrightPay will indicate if a monthly return has no subcontractor payments i.e. a Nil return. It is important to tell HMRC that you have not made any payments to subcontractors during the tax month, this is done by making a nil declaration. 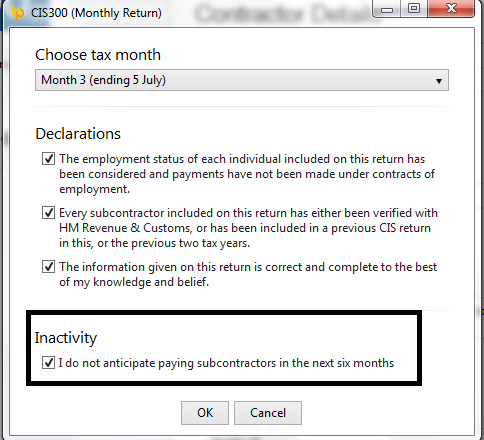 7) When ready to submit the Monthly Return to HMRC, click 'Send Now'. 8) Confirmation details will subsequently appear on screen to indicate that your submission has been accepted by HMRC. 9) Should your submission fail, simply click on 'Details' for more information on why your submission has been rejected by HMRC and make amendments where required.